Alchemy Stones: How Many Alchemy Stones are Made? How Many Alchemy Stones are Made? Somebody wrote in and asked "how many Alchemy Stones there are," and how many I make. After considering for a bit-- and because I am an art collector, myself-- I realized that the question was indirectly asking whether Alchemy Stones are collectible and have a "value." To be perfectly honest, Alchemy Stones really haven't been around long enough to have established a track record in that sense. That said, we already have at least a dozen people who have bought multiple stones over time and must have somewhat of a "collection" by now. So the short answer to this line of thinking is "If you like 'em, buy your favorite ones and collect 'em!" That's how it has been for me, when I have accumulated a number of a single artist's art pottery pieces, for example. To arrive at a more "serious" answer, I would have to respond by saying "come back and ask that question again when Alchemy Stones have been in the public eye for 8-10 years or more. 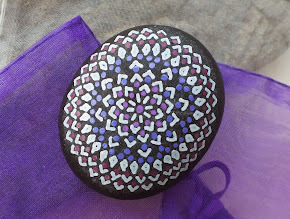 And in that context, what I can tell you is that I have been working with these patterns for almost 50 years-- the last four using beach stones-- and I have no plans to stop now. So the stones will continue to be around-- this is no "temporary diversion" for me. Now, to get back to the root of the original question, the answer is "not very many." Keep in mind that each stone is entirely hand painted, and that creating the stones is not my "day job." Also keep in mind that each stone is not just "about the painting," but has to be found, then painted, then dried, then signed and given a finish coat... then photographed and listed on one of our web sites. This all requires a considerable time investment and puts a definite cap on how many stones can be made. 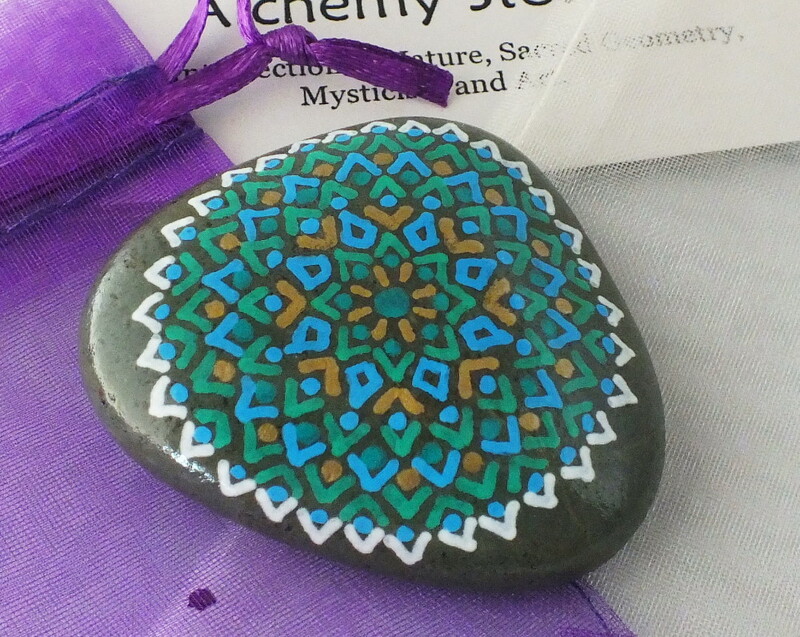 Alchemy Stones will never be a "mass production" gig... and-- perhaps-- in that you can also find part of the answer as to whether the stones will become "collectible." Are painted stones "collectible?" Well, I'm by no means the only person who paints on beach stones, and some of my fellow stone painters do really excellent work-- so painted stones, as a whole, might be a really interesting and unique thing to build a collection of. Now if you are just looking for the "cold hard facts," the answer is (so far) "fewer than 250 stones a year." Which is just not a whole lot, no matter how you look at it.